Undergraduates typically learn to calculate in courses like physics, engineering, and mathematics where it is feasible and desirable to make relatively precise calculations. Important variables in physical sedimentary geology (e.g. sediment fluxes, flow depths, channel slopes, sedimentation rates, settling velocities) generally cannot be constrained to comparable levels of precision; often an order of magnitude or so is the best we can do. Because the precise quantitative tools that students have learned are often not applicable, and because our field has a history of being relatively descriptive, it's easy to skip over quantitative methods in sedimentary geology altogether, or to relegate them to traditional but restrictive application areas (e.g. statistics of size distributions). 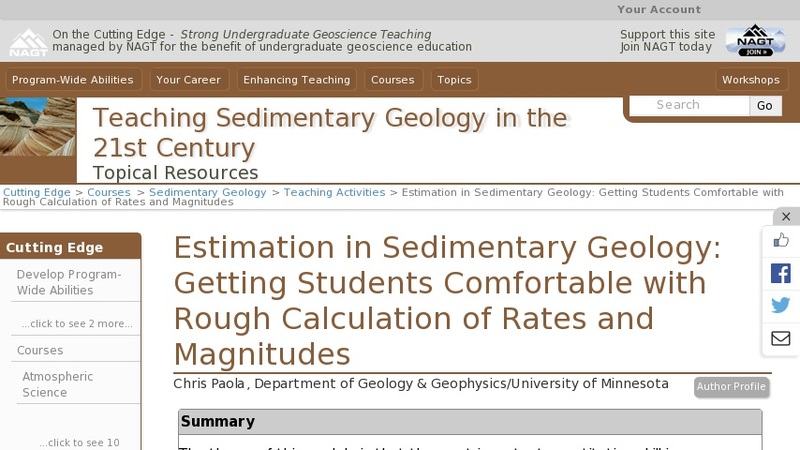 The theme of this module is that the most important quantitative skill in sedimentary geology is not complex mathematics but rather a habit of approximate but accurate quantitative thinking. The most useful tool is the ability to make reasonable order of magnitude estimates based on a sense of the magnitudes of important quantities like settling velocity, river slope, subsidence rate, etc. We discuss practical estimation methods based on field observable quantities like grain size and flow depth, as well as methods for applying general geologic knowledge (e.g. rates of plate motion) to estimation of important quantities in sedimentary geology. There is no one activity for this unit. In the examples covered, students learn to estimate directly grain size and flow depth in the field, and then to calculate approximate values of shear stress, slope, flow speed, settling velocity, relative degree of suspension, sediment flux, and rate of bedform migration and deposition. They also derive order of magnitude estimates of rates of long-term sediment supply and rate of deposition to compare with these.